I was looking through photo files and stumbled across this picture from Halloween 2011. 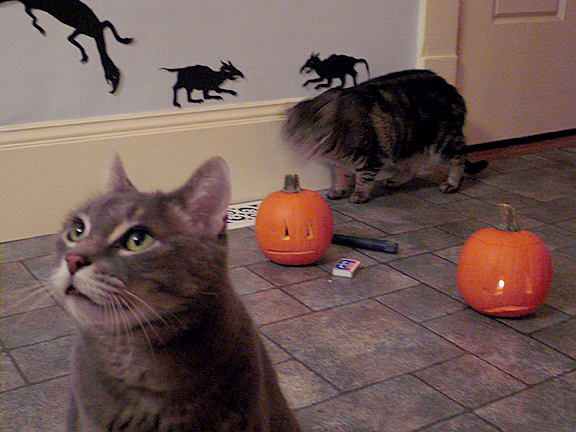 This is bittersweet to me because I like the moment it captures…Emma not quite knowing what to make of the small pumpkins…Tom’s scary critters on the wall…and Toby in the forefront, looking up at Tom as I snap the picture. We don’t usually do much for Halloween, and I’d forgotten all about this…so it’s nice to have the reminder. The bittersweet comes because Toby died in August, and I haven’t really come to terms with the loss. He came into our lives when he was about 2 years old, and was with us for over 15. He was an exceptional cat and a wonderful companion. He was greatly loved and is terribly missed.